Valentin Debise gave Team Hammer it’s 200th podium finish and 70th victory on Saturday at PittRace. Team Hammer concluded the MotoAmerica weekend at Pittsburgh International Race Complex in mixed fashion, combining a historic win with multiple strong performances and a race that delivered stinging disappointment. JD Beach won Sunday’s Supersport race at PittRace and has a virtual lock on the series championship. 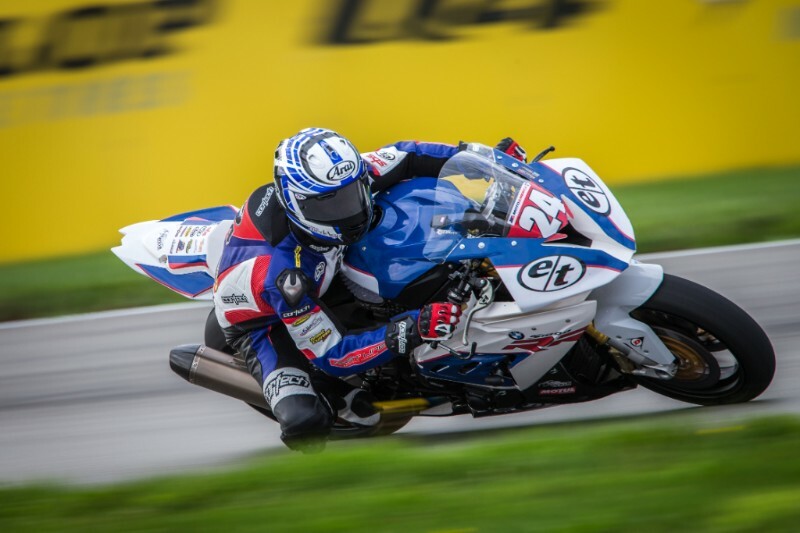 Superbike points leader Cameron Beaubier continued his pursuit of a third career title at the MotoAmerica Championship of Pittsburgh, earning valuable points with a hard-fought second-place finish in Race 2 on Sunday. With two rounds remaining in the 2018 MotoAmerica AMA/FIM North American Road Racing Championship, Beaubier holds a 56-point lead in the championship standings. Toni Elias spays the bubbly after winning the Motul Superbike race on Sunday. Yoshimura Suzuki Factory Racing’s Toni Elias scored a nail-biting victory in Sunday’s MotoAmerica Superbike race at Pittsburgh International Race Complex (PittRace). Defending series champ Elias and current series leader Cameron Beaubier passed each other several times on the final lap with Elias scratching and clawing his way to his seventh victory of the year. Kyle Wyman wheelies his KWR Yamaha during racing action from PittRace. The KWR team brought home solid finishes this weekend at Pittsburgh International Race Complex. Kyle Wyman finished 10th/8th in Superbike races one and two on his Harv’s/KWR Yamaha, while Bryce Prince scored his first ever podium results in the Supersport class with a 3rd/3rd on the weekend on his RiderzLaw/KWR Yamaha. Alex Dumas was a perfect two-for-two in Liqui Moly Junior Cup racing from PittRace. 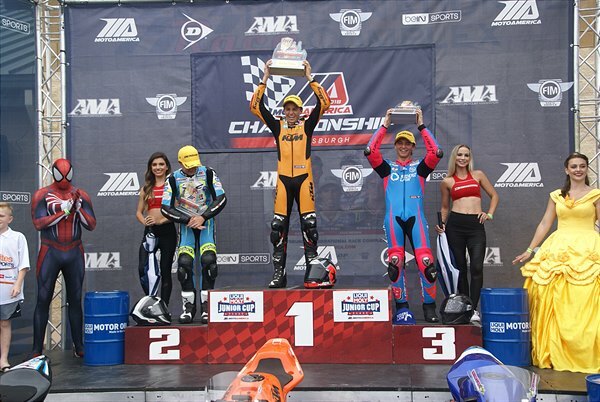 KTM Orange Brigade rider Alex Dumas is now two steps closer to claiming the inaugural MotoAmerica Junior Cup Championship following a dominant 1-1 performance at Pittsburgh International Race Complex in Wampum, Pennsylvania over the weekend. With two victories at the eighth round, Dumas now has a 64-point lead in the championship standings with only two rounds remaining. Mathew Scholtz was fourth on Sunday after finishing on the podium on Saturday at PittRace. After reaching the podium with a third-place finish under partially wet/partially dry track conditions in Saturday’s MotoAmerica Superbike Race 1 at Pittsburgh International Race Complex, Mathew Scholtz came to the track on Sunday morning and was the fastest rider in the Superbike warmup session, which gave Mathew and the Yamalube/Westby Racing team increased confidence heading into the afternoon’s Superbike Race 2. And, while Mathew didn’t emerge with another podium finish to match his Saturday result, he did finish fifth to round out a very solid weekend. Travis Wyman crashed on the first lap, but remounted under a red flag to finish fourth in the Stock 1000 race. 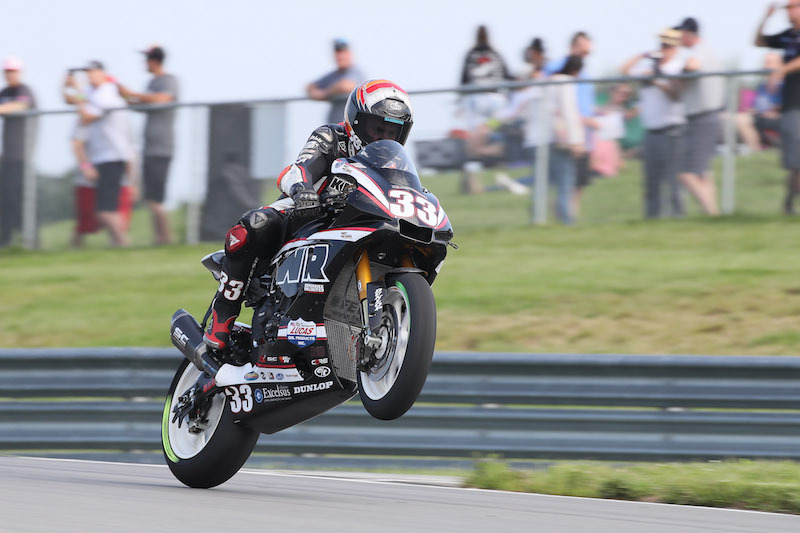 Travis Wyman’s mental toughness was on full display during Sunday’s MotoAmerica Stock 1000 Class race at Pittsburgh International Race Complex. The Weir Everywhere Racing BMW rider recovered from an early race crash to score a fourth-place finish at the MotoAmerica Championship of Pittsburgh. Wyman’s comeback performance allowed him to maintain his second place in the championship standings, as well as kept his championship hopes alive. The team came into the weekend with a new, untested suspension package for its BMW S 1000 RR, and used the Saturday morning practice session to get the bike set up for Wyman. Saturday afternoon’s qualifying session saw Wyman capture sixth place on the starting grid. The overnight rain soaked the track for Sunday morning’s qualifying session, and Wyman was unable to move any further up the starting grid. Wyman got a good start in the Sunday afternoon race but made contact with another rider at Turn 3 and crashed. The race was red flagged for a separate incident shortly after Wyman crashed, and he was able to ride the damaged BMW back to pit lane. The team worked feverishly to repair the bike and Wyman was able to take the restart from the back of the grid. Wyman quickly made his way up the running order, advancing from 11th to fifth in two laps. The race ended with a second red flag and Wyman was credited with his fourth top-five finish of the 2018 season. The next round of the MotoAmerica Stock 1000 Class Championship takes place at New Jersey Motorsports Park, Sept. 7-9. The track has been a stalwart on the American professional motorcycle road racing calendar for over a decade. Hopefully Wyman will be able to use his considerable experience at the track to score his third win of the season.